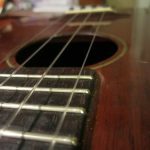 We’re a group of uke players who meet each Tuesday at 7:00pm at The Hancock Recreation Center – 811 E. 41st Street, Austin, TX. (Hancock Rec Center Web). Ask at the front desk and they’ll point the way. We open our meetings by playing a couple of songs that we haven’t played for a while. Then we play a few songs from our current, and ever-changing quarterly songbook. Our current song sheet is always available here – and it changes as folks bring in songs they like and we try new songs – we’re open to anything! At the end of each quarter we pull a dozen or so songs from our current songbook, print song books, and have an open uke jam at a local watering hole – we call it a Uke-Along. We take our loaner ukes and usually get some bystanders involved – it’s a lot of fun. From 6:30pm to 7:00pm each Tuesday (right before our TUG meeting) we have a little Flash Class. This is a short group practice where we work on strums – finger-picking – chord patterns – simple 2-chord songs – anything folks want to work on. If you have any questions drop us an email – info@tuesdayukes.org. We’re very informal, and this is a friendly group – so come out and play ukes with us.